A/C evaporator core orifice (19D990). 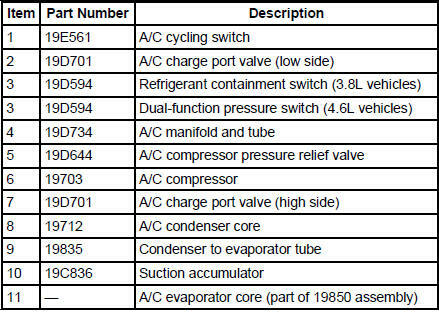 A/C compressor pressure relief valve (19D644). Refrigerant containment switch (3.8L) (19D594). Dual-function pressure switch (4.6L) (19D594). The refrigerant system incorporates an A/C compressor controlled by an A/C cycling switch. The A/C cycling switch senses A/C evaporator core pressure to control A/C compressor operation. An A/C compressor pressure relief valve is installed in the A/C manifold and tube (19D734) to protect the refrigerant system against excessively high refrigerant pressures. An evaporator core orifice is installed in the A/C evaporator core inlet tube to meter the liquid refrigerant into the A/C evaporator core. A refrigerant containment switch is installed on 3.8L vehicles to cut-off A/C compressor operation in the event of abnormally high refrigerant system pressure. A dual-function pressure switch is used on 4.6L vehicles for cooling fan control, and to cut-off A/C compressor operation in the event of abnormally high refrigerant system pressure. NOTE: Internal A/C compressor components are not serviced separately. The FS-10 A/C compressor is serviced only as an assembly. The A/C clutch pulley, A/C clutch field coil (19D798) and the shaft seal are serviceable. A ten-cylinder swashplate design utilizing the tangential design mount. A one-piece lip-type seal (installed from the front of the A/C compressor) is used to seal it at the shaft opening in the assembly. Five double-acting pistons operate within the cylinder assembly. The pistons are actuated by a swashplate that converts the rotating action of the shaft to a reciprocating force. Reed-type discharge valves are located between the cylinder assembly and the head at each end of the A/C compressor. The A/C compressor uses PAG oil, or equivalent. This oil contains special additives required for the A/C compressor. The A/C compressor oil from vehicles equipped with an FS-10 A/C compressor may have some dark colored streaking while maintaining a normal oil viscosity. This is normal for the A/C compressor and is caused by break-in wear of the piston rings. It drives the compressor shaft. When the battery positive voltage (B+) is applied to the A/C clutch field coil, the clutch plate and hub assembly is drawn toward the A/C clutch pulley. The magnetic force locks the clutch plate and hub assembly and the A/C clutch pulley together as one unit, causing the compressor shaft to rotate. When (B+) is removed from the A/C clutch field coil, springs in the clutch plate and hub assembly move the clutch plate away from the A/C clutch pulley. relieve unusually high refrigerant system discharge pressure buildups. For specifications regarding operating pressure(s), refer to Section. prevent damage to the A/C compressor and other system components. avoid total refrigerant loss by closing after the excessive pressure has been relieved. It is an aluminum fin and tube design heat exchanger located in front of the vehicle radiator (8005). It cools compressed refrigerant gas by allowing air to pass over fins and tubes to extract heat and by condensing gas to liquid refrigerant as it is cooled. The condenser to evaporator tube (19835) contains the high pressure liquid refrigerant upstream of the evaporator core orifice. The upstream side contains low pressure refrigerant gas. The downstream side contains high pressure refrigerant gas and a fitting used to mount a serviceable high pressure A/C charge port valve. The downstream side also contains a fitting used to mount the refrigerant containment switch (3.8L) or dual-function pressure switch (4.6L). A long-travel Schrader-type valve stem core is installed in the fitting so that the switch can be removed without discharging the A/C system. NOTE: The evaporator core is not separately serviceable, it is serviced only with the evaporator core housing assembly. NOTE: Installation of a new suction accumulator is not required when repairing the air conditioning system except when there is physical evidence of contamination from a failed A/C compressor or damage to the suction accumulator. The A/C evaporator core is the plate/fin type with a unique refrigerant flow path. A mixture of refrigerant and oil enters the bottom of the A/C evaporator core through the A/C evaporator core inlet tube and moves out of the A/C evaporator core through the A/C evaporator core outlet tube. This flow pattern accelerates the flow of refrigerant and oil through the A/C evaporator core. NOTE: The evaporator core orifice is an integral part of the condenser to evaporator line and should be installed as an assembly with the line. NOTE: A new evaporator core orifice should be installed whenever a new A/C compressor is installed. It is located in the A/C condenser to evaporator line. It has filter screens located on the inlet and outlet ends of the tube body. The inlet filter screen acts as a strainer for the liquid refrigerant flowing through the evaporator core orifice. O-ring seals on the evaporator core orifice prevent the high-pressure liquid refrigerant from bypassing the evaporator core orifice. Adjustment or repair cannot be made to the evaporator core orifice assembly. A new evaporator core orifice must be installed as a unit. The suction accumulator is perforated. The refrigerant system has been opened to the atmosphere for a period of time longer than required to make a minor repair. There is evidence of moisture in the system such as internal corrosion of metal refrigerant lines or the refrigerant oil is thick and dark. The suction accumulator (19C836) is mounted to the A/C accumulator bracket (19D606) to the right of the vehicle centerline. The inlet tube of the suction accumulator attaches directly to the A/C evaporator core outlet tube and the outlet tube attaches to the A/C manifold and tube. After entering the inlet of the suction accumulator, the heavier oil-laden refrigerant contacts an internally mounted dome (which serves as an umbrella) and drips down onto the bottom of the canister. A small diameter oil bleed hole, in the bottom of the vapor return tube, allows the accumulated heavier liquid refrigerant and oil mixture to reenter the compressor suction line at a controlled rate. As the heavier mixture passes through the small diameter liquid bleed hole, it has a second chance to vaporize and recirculate through the A/C compressor without causing compressor damage due to slugging. A fine mesh screened filter fits tightly around the bottom of the vapor return tube to filter out refrigerant system contaminant particles. A desiccant bag is mounted inside the canister to absorb any moisture which may be in the refrigerant system. A fitting located on the top of the suction accumulator is used to attach the A/C cycling switch. A long-travel Schrader-type valve stem core is installed in the fitting so that the A/C cycling switch can be removed without discharging the A/C system. The A/C cycling switch is mounted on a Schrader-type valve fitting on the top of the suction accumulator. A valve depressor, located inside the threaded end of the A/C cycling switch, presses in on the Schrader valve stem. This allows the suction pressure inside the suction accumulator to control the operation of the A/C cycling switch. The electrical switch contacts open when the suction pressure drops. The contacts close when the suction pressure rises. For specifications regarding operating pressure(s), refer to Section. The A/C cycling switch will control the A/C evaporator core pressure at a point where the plate/fin surface temperature will be maintained slightly above freezing. This prevents icing of the A/C evaporator core and blockage of air flow. It is not necessary to discharge the refrigerant system to remove the A/C cycling switch. The dual-function pressure switch is used to interrupt A/C compressor operation in the event of high system discharge pressures. The dual-function pressure switch is mounted on a Schrader valve-type fitting on the high pressure side of the A/C manifold and tube. It is not necessary to discharge the refrigerant system to remove the dual-function pressure switch. A valve depressor, located inside the threaded end of the dual-function pressure switch, presses on the Schrader valve stem. This allows the dual-function pressure switch to monitor the compressor discharge pressure. When the compressor discharge pressure rises, the switch contacts open, disengaging the A/C compressor. When the pressure drops, the contacts close to allow operation of the A/C compressor. For specifications regarding operating pressure(s), refer to Section. The dual-function pressure switch has a second set of electrical contacts used for high-speed cooling fan control. When the compressor discharge pressure rises, the contacts close and engage the high speed fan control. When the pressure drops, the contacts open and the high speed fan control is disengaged. The refrigerant containment switch is used to interrupt A/C compressor operation in the event of high system discharge pressures. The refrigerant containment switch is mounted on a Schrader-type valve fitting on the high pressure side of the compressor manifold and tube assembly. A valve depressor, located inside the threaded end of the refrigerant containment switch, presses on the Schrader valve stem. This allows the refrigerant containment switch to monitor the A/C compressor discharge pressure. When the A/C compressor discharge pressure rises, the switch contacts open, disengaging the A/C compressor. When the pressure drops, the contacts close to allow operation of the A/C compressor. For additional information regarding operating pressure(s), refer to Section. It is not necessary to discharge the refrigerant system to remove the refrigerant containment switch. The spring lock coupling is a refrigerant line coupling held together by a garter spring inside a circular cage. When the coupling is connected together, the flared end of the female fitting slips behind the garter spring inside the cage of the male fitting. The garter spring and cage then prevent the flared end of the female fitting from pulling out of the cage. Three O-ring seals are used to seal between the two halves of the A/C condenser core couplings. All other couplings have two O-ring seals. Use only the O-ring seals listed in the Ford Master Parts Catalog for the spring lock coupling. A plastic indicator ring is used on the spring lock couplings of the A/C evaporator core to indicate, during vehicle assembly, that the coupling is connected. Once the coupling is connected, the indicator ring is no longer necessary but will remain captive by the coupling near the cage opening. The indicator ring may also be used during repair operations to indicate connection of the coupling. An A/C tube lock coupling clip (19E746) may be used to secure the coupling but is not required. 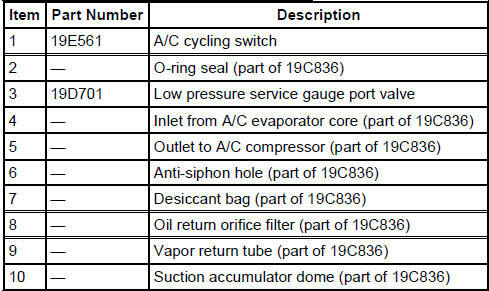 The high-pressure service gauge port valve is located on the A/C manifold and tube. The low pressure service gauge port valve is located on the suction accumulator. The fitting is an integral part of the refrigeration line or component. Special couplings are required for both the high side and low side service gauge ports. A new Schrader-type valve core can be installed if the seal leaks. Always install the A/C charging valve cap (19D702) on the service gauge port valves after repairing the refrigerant system.